<!- John Constable 1776 – 1837--> John Constable 1776 – 1837. The Cornfield – Large Plate. Mezzotint. The Cornfield 1832/34. Mezzotint by David Lucas (1802-1881) after John Constable. Shirley 36.iv. Christopher Lennox-Boyd vi/vi. London: Republished Feb.y 15, 1853, by Thomas Boys (of the late Firm of Moon, Boyd & Greaves,) Printseller to the Royal Family, 467, Oxford Street - Paris. E.Gambart & C. 9 Rue d'Orleans au Marais,-Depose. Originally Published July 1.1834. Image 22 1/4 x 19 1/2, plate 26 3/4 x 20 3/8, sheet 30 3/4 x 24 3/8. A rich impression printed on sturdy wove paper with full margins, mounted on archival paper. A few unobtrusive scrapes and folds, one horizontally across the center of the image, and a faint waterstain in the top right-hand image and margin. Signed in the plate. Housed in a 35 x 25 inch archival double mat. $1,250. The Cornfield depicts Fen Lane as it leads from East Bergholt towards Dedham; a village in the borough of Colchester. A flock of sheep are followed by a dog as the path winds towards figures active in a cornfield. A boy, prone and with his face on the surface of a stream, slakes his thirst. The church in the distance is thought to have been an invention on Constable's part. First exhibited at the Royal Academy in 1826, Constable's The Cornfield became one of the artist's most celebrated works. It was reproduced in mezzotint by David Lucas in 1834, and sold by J. McLean and Hodgson, Boys and Graves, and Rudolph Ackermann. 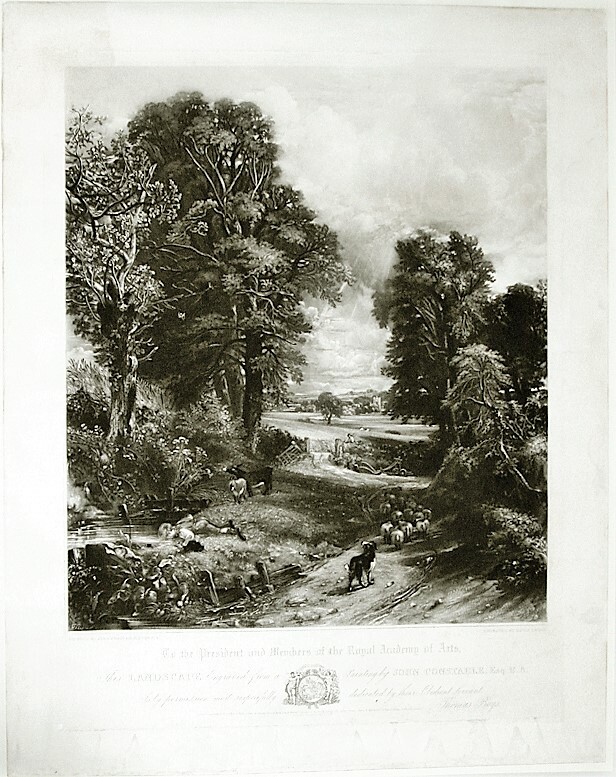 This print, however, derives from a posthumous collection of Constable's works entitled 'English Landscape Scenery,'edited by H.G. Bohn and published by Thomas Boys in 1853. The series consisted of forty mezzotint engravings on steel plates; all of which were produced by Lucas. The Cornfield is, today, one of Constable’s best-known works. It was also the first of his pictures to enter a public collection. Shortly after his death in 1837, a committee was set up to subscribe towards the purchase of a painting for the nation, and The Cornfield was bought for the National Gallery for 300 guineas. The list of subscribers included the poet William Wordsworth, the scientist Michael Faraday, and several artists. 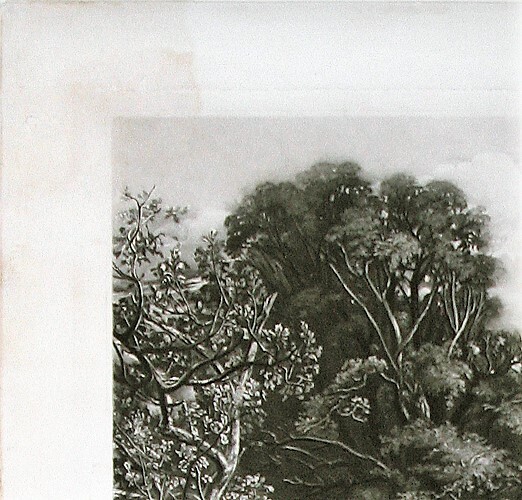 This print of the subject was published in 1834, and was a great commercial success. However, Constable never found a buyer for the painting during his own lifetime. John Constable (1776-1837) : The Mezzotints John Constable is recognised as one of England’s greatest romantic landscape artists. Born in Suffolk he is principally known for his paintings of Dedham Vale, the area surrounding his home, now affectionately referred to as ‘Constable Country’. He once famously wrote ‘I should paint my own places best’. In the late 1820s Constable became aware of the artistic possibilities of the medium of mezzotint and he decided to start publishing prints of his paintings, hoping to introduce his critically acclaimed views of the English landscape to a wider audience. This became a reality upon his 1829 meeting of the young engraver David Lucas (1802-1881). By way of trial Lucas made two small prints, ‘Approaching Storm’ and ‘Departing Storm’. 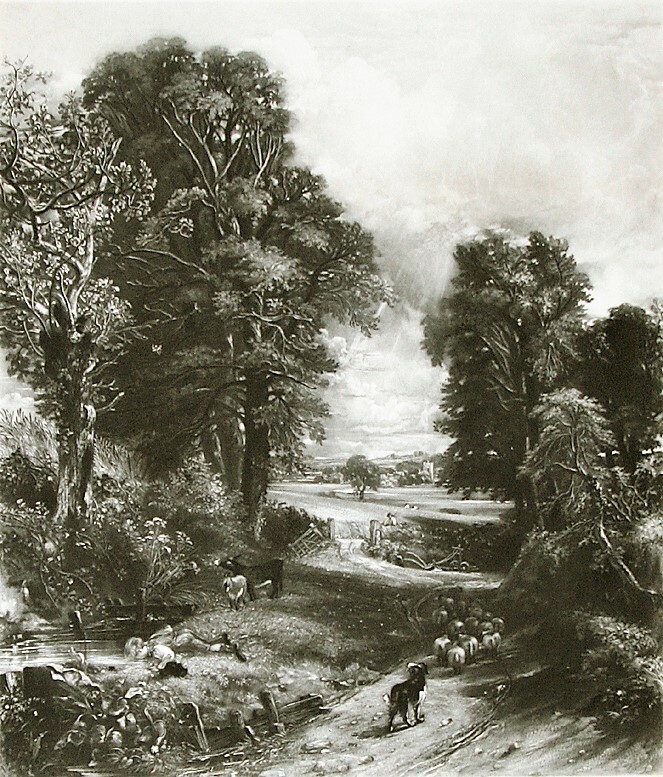 Constable was so impressed by the results that together they embarked on a series of mezzotints to be published as ‘Various Subjects of Landscape, Characteristic of English Scenery’ now acknowledged as one of the greatest examples of a collaboration between artist and printmaker in the history of printmaking. Constable would explain his ideas to Lucas and provide the initial conception for each image, Lucas would then interpret his ideas onto a preliminary plate which Constable then altered, retouched and commented upon until the print was considered complete. The medium of mezzotint was especially suited to the project of illustrating ‘the chiaroscuro of nature’ due to the development of the image from dark to light and the wide range of velvety tones possible through this medium. The mezzotints are based on a wide range of oil sketches and finished paintings which Constable had created over the course of his career. David Lucas (1802 - 1881) was a British printmaker who specialised in mezzotint. He was a pupil of Samuel William Reynolds, and worked from Bryanston Square, London, upon the completion of his education. He produced prints after Gainsborough, Vernet, Isabey and Hoppner amongst others, but it was his works after Constable that earned him true renown. The collaboration between the pair was one of the most successful in the history of British printmaking. Whilst Turner amassed a group of faithful engravers to whom he would turn, Constable virtually employed only Lucas, and this fidelity was repaid by the stunning translation his work received from 1829, until long after his death in 1837.